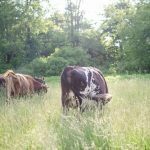 Long ago (6 years) and in a far away land (2 hours north of where I sit now) I brought home my first milk cow, Maybelle. She was young and bred and dry. In just a few months we would learn how to milk a cow and be swimming (not literally) in all of the glorious raw milk she would give us after she had a calf! Flash forward (to the next morning) and we found an uncomfortable cow in the barn with a bulging udder. She needed to be milked! She was not dry after all. Even though her previous owner wasn’t milking her, clearly the older calves out in the pasture were and now she needed some relief. But we didn’t know how to milk a cow… or even what supplies we needed! She was in a new place for the first time in her life with new people and she wasn’t about to let us put our grubby hands on her nether regions. We figured we had time, months even, to get that all worked out. Thankfully, we had a good friend who knew what he was doing. He kindly dropped his plans and came over to help us get it all figured out. 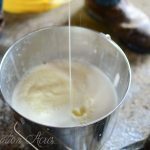 The next morning we poured ourselves a glass of raw milk with breakfast and never looked back. There’s no need to ask where I land on the Cow vs. Goat question. When I come to the end of my life, my kids are going to be asking themselves what they’re going to do with mom’s cow. But most of us don’t have a friend to call up in a panic so I’m going to be that friend for you and show you how we hand milk our family cow. We choose to hand milk instead of using a machine for a few simple reasons. We’ve had a machine for the last couple years and found that the total milking time isn’t quicker with a machine. 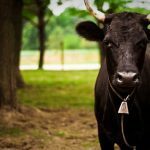 You spend your time cleaning and sanitizing a machine instead of with your cow. (And I already hate doing dishes as it is.) Not only that but it’s quieter and more peaceful. 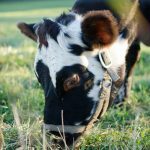 It gives you a reason to get your hands on your cow and find out more quickly if there are any issues with her health. Whereas with a milk machine our milker usually spent milking time flipping through social media. Not to mention the strong arms you’ll have after a few weeks on the stool. From start to finish milking our cow takes about as long as it will take you to watch the video, about 15-20 minutes… Since we don’t have to explain everything along the way. A couple kids milked last weekend while I did the dishes and they were back in before I was done. We’re getting about a gallon a day right now so depending on your experience and your cow. It could take longer or shorter than that. In the video, I cover and discuss every aspect of our milking routine in detail. The how’s and why’s of what we do at milk o’clock, but please ask questions if you have any! 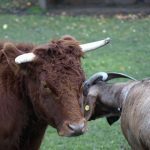 « Cow vs Goat: Which Should You Raise on Your Homestead? INCREDIBLY HELPFUL. I’m on my way to save up to buy my own farm (Been wanting to since I was young), but I haven’t actually gotten to live that life before! Your posts are very thorough, clear, and easy to follow. Holly is beautiful too! Thank you guys for the video.